Okay. So. You know I love my cheeseburgers, foie gras, and sushi. But when a friend recently went on a vegan kick just to challenge herself and cleanse her body of dairy, I decided to join her. You know. For fun. I am lucky enough to live around the corner from Crossroads, a fine dining vegan restaurant on Melrose in Los Angeles. I have to tell you, if this is what it means to be vegan, I'm on board. 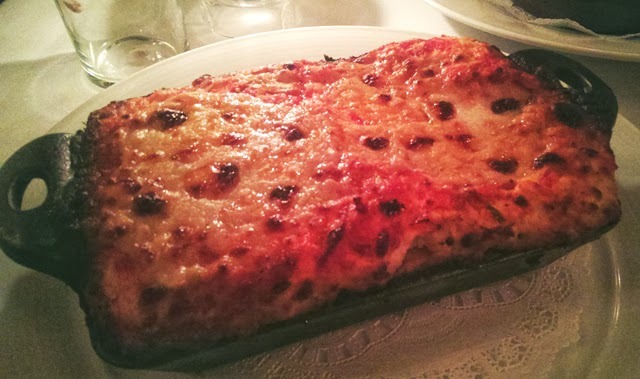 Lasagna made with cashew cheese. Spaghetti squash that has renewed my love of the vegetable. Crabs cakes made from hearts of palm and artichokes. Delicious, fresh, rich, unique dishes delicious in their own right, not masquerading as anything else but yummy. And I felt much better after devouring this platter, I have to tell you. My own homemade pasta marinara with meatballs is still my fave, but for a change and something healthy, Crossroads is killer.